Kaysville, Utah – April 19, 2012 – OEMSensors.com (http://www.oemsensors.com) is launched today by Monnit Corporation with a new line of OEM-ready wireless sensors, gateways and back-end monitoring software targeting broad lines of commercial, industrial and M2M applications. The launch addresses the large demand for an easily integrated line of wireless sensors into new or existing OEM offerings. “With our many years of experience in RF technology, we have seen the extensive reach that a robust OEM offering can attain. Upon starting Monnit, we soon saw the void that existed for an integrated wireless sensor system. Our team has spent years bringing our RF, system architecture and web portal expertise to bear in creating a truly unique, robust and diverse wireless sensors system for OEMs in any industry. Any OEM interested in wireless sensors now has a flexible, fast time- to-market, quick return-on-investment option.” said Brad Walters, Founder and CEO of Monnit. With over 27 unique sensor types, OEMSensors.com’s wireless sensors can easily integrate into existing single board computers, gateways and other M2M industry manufactured products or be customized to work with new sensor types. 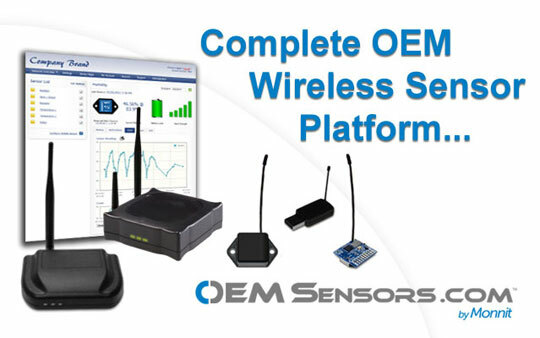 For more information on OEMSensor.com’s, wireless sensors, gateways and monitoring software call (801) 561-5555 or visit the Website at http://www.oemsensors.com. OEMSensors.com is a division of Monnit Corporation. Leveraging the development work by Monnit, OEMSensors.com brings a fully tested, FCC compliant wireless sensors platform to those wishing for a completely brandable OEM wireless sensors solution that can be easily integrated into existing systems, products and services. Understanding the Ethernet Gateway Lights and troubleshooting. The process for setting up your Monnit Ethernet Gateway should be as simple as plugging in the Ethernet cable and power plug then watching as the lights flash a little then turn solid green. Sometimes the lights may continue to flash red, indicating that there may be a connection or settings issue. We have compiled this troubleshooting information to help you determine what the issue may be. To help ensure that there are no issues to begin with, we recommend using the Ethernet Gateway configuration documentation located on Monnit’s support page for information on properly setting up your Monnit Ethernet Gateway. Try unplugging the power to the gateway, wait 10 seconds, then plug it back in. If that doesn’t work, please use a small tool, like a toothpick or paperclip, to press and hold the reset button on the back of the gateway. Press and hold the button for 5 seconds, until you see the LEDs begin to flash. 1. There is no internet access available. 2. Port 3000 is blocked. 4. DNS cannot be resolved. 5. IP address is invalid. 6. The Ethernet cable is not connected. 7. There is an issue with the device MAC address. View the Ethernet Gateway configuration documentation for more information on correctly setting the gateway parameters to address these issues. The gateway cannot connect to the server. The gateway configuration settings are not correct. Set the gateway back to the defaults by pressing and holding the reset button. The Ethernet gateway has been able to contact the server and gets a response; however, the APN is not going from Idle to Active. There may be a problem with the hardware, contact Monnit support atsupport@monnit.com or 801-561-5555. If you are still experiencing any issues that you are unable to troubleshoot with these tips, please contact Monnit support by emailing support@monnit.com or calling 801-561-5555. Monitoring Vacant Properties for Temperature, Water Intrusion and Access. Whether you are a real estate agent, or vacation home property manager, it is important to monitor your properties if you can’t be there in person. Damage from severe temperature changes, water intrusion and trespassing can be costly. Get real-time notifications about your properties. Monnit provides low-cost wireless sensors that can keep track of homes when you can’t be there. Know immediately about any unauthorized access by using wireless open/closed sensors and wireless motion sensors. Use wireless temperature sensors to monitor for temperature changes and wireless water sensors in basements or around water heaters, toilets and faucets to monitor for water leaks. You can also conserve electricity by using wireless light sensors and wireless voltage sensors to be notified if lights or appliances are left on. Monnit’s new Cellular Gateway ensures that you receive all of your sensor data without the need for an active internet connection in the home. 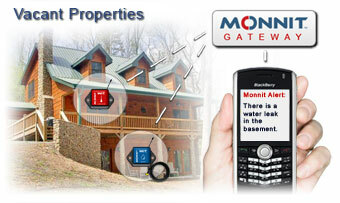 If the home has an active internet connection, you can use Monnit’s Ethernet Gateway, without needing a computer on the premises. Enjoy peace of mind while remotely managing your properties.